Greenleaf Book Group Press, 9781626342057, 216pp. When budgets are strained and changes are a constant on every horizon, it takes effective leadership to reinvigorate the government workplace. 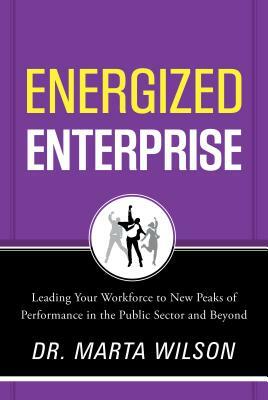 In "Energized Enterprise," Dr. Marta Wilson helps you, as a leader in the public sector, be your best, do great things, and achieve meaningful success as you lift your workforce to new heights. Federal agencies allow employees to support fulfilling missions maintaining a robust national park system, wielding the world's best military, and exploring the frontiers of space. These careers are some of the most prestigious and desirable, but still many employees in the public sector are dissatisfied, unmotivated, and disengaged. The good news is that there are that leaders can exhibit powerful behaviors to boost satisfaction, motivation, and engagement. Lead your workplace to new peaks of performance in the public sector by applying the proven tools and techniques in Energized Enterprise. Develop effective leadership skills to promote success at individual, team, and enterprise levels, resulting in a workforce that is engaged and filled with people who are alert, growing, and making a bigger difference. "Energized Enterprise "shows you how to put both the human element and the total enterprise at the forefront of your leadership strategy and daily actions, offering fundamental principles of effective leadership, seven key leadership rules, as well as research, stories, and practical examples. Utilizing Dr. Wilson's expertise, you ll implement the very best leadership practices to lift, nourish, and energize your workforce to advance your enterprise to the leading edge. Dr. Marta Wilson has dedicated her career to leadership consultancy while serving as board member, author, catalyst, coach, mentor, researcher, speaker, trainer, volunteer, and fundraiser. She holds a PhD in industrial-organizational psychology from Virginia Tech specializing in leadership effectiveness. As founder and CEO of Transformational Systems, Inc. (TSI), she leads TSI s dynamic group of possibility thinkers to help executives achieve bold enterprise transformation goals. For five consecutive years, TSI has ranked on Inc. s Fastest Growing Companies in America list, and the company has also made the prestigious Virginia s Fantastic 50 list. The "Washington Business Journal" named Dr. Wilson as one of the twenty-five leading businesswomen in the DC metropolitan area. Wilson has authored several books including "Everybody s Business: Engaging Your Total Enterprise to Boost Quality, Speed, Savings, and Innovation" and "Leaders in Motion: Winning the Race for Organizational Health, Wealth and Creative Power.""